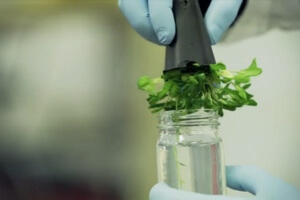 Kickstarter Campaign To Create Glowing Plant Goes Viral - Singularity Labs FTW! 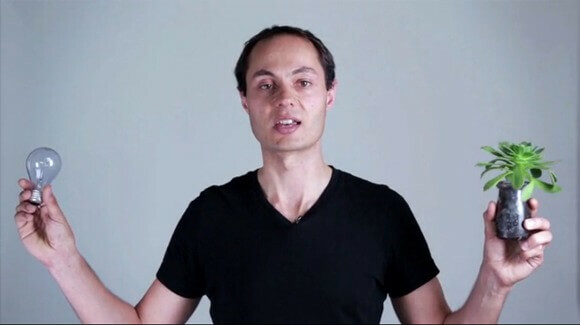 The core team includes Omri Amirav-Drory, a postdoctoral fellow at Stanford and founder of the gene building startup Genome Compiler, a Singularity University company coming out of the rapidly expanding Singularity Labs. Also part of the core team are Senstore co-founder Antony Evans, and Kyle Taylor, a biologist who teaches Intro to Molecular and Cell Biology at the biohacker space BioCurious. The three have now joined forces at Singularity University. I got a chance to speak with Evans, the group’s Project Manager, and ask him about the groups’ exciting and eccentric vision. 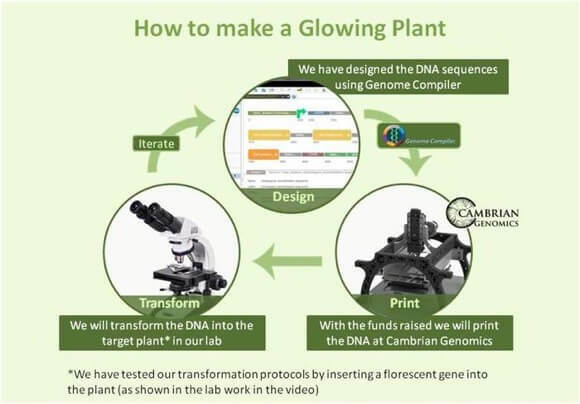 To create the glowing plants, the team will first generate modified genes with the Genome Compiler software, then insert them into Arabidopsis, a small flowering plant related to mustard and cabbage (they make sure to point out that the plant is not edible). The main gene, luciferase, is the same one that makes fireflies light up the night. Evans acknowledges that this isn’t the first time luciferase has been used to create glowing plants. But to create plants bright enough to light our way will take a lot of optimizing. The feature that they’ve already worked out is modifying the luciferase gene so that it recycles, as lots of the enzyme will be needed to make the plant sufficiently bright. With Genome Compiler they’re able to design and print DNA, to make new sequences from scratch. But even while the price of DNA synthesis drops, costs can mount quickly, especially when you’re troubleshooting. At the time of this writing, the Kickstarter campaign had raised over $64,000 – less than a thousand shy of their goal after just three days. The more money the group gets, the more genes they’ll be able to print and test. Want to support the cause, or maybe just have the only house on the block with a glowing yard? People from the US who back with $40 or more will be sent seeds (50 to 100) of their own so they can cultivate the glowing crop in their own backyard. They emphasize that the seeds will never be sold commercially, so the only chance ever to get the seeds is through Kickstarter. Those interested can follow them on twitter or Facebook or follow developments on their blog. And anyone in the Sunnyvale, CA area can meet up with the team at the Bioluminesence Community meetups at BioCurious Monday evenings.